It's a quiet day in the Myren household and my husband is loving it. He's loving it because I'm on voice rest for 6 weeks! Some of you know that I'm a music teacher by day. The wear and tear on my voice have resulted in two vocal fold surgeries and a myriad of other problems. So what am I doing to express myself? Why stamping of course! Along with the three ink colors, I also used three stamp sets. 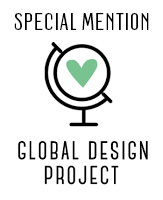 I often use stamps from one or two sets to complete my projects. 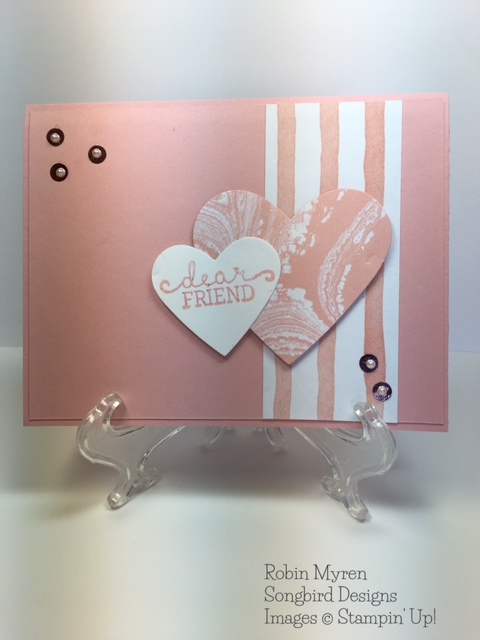 The flower and leaves are stamped with the set What I Love which is in the 2016 Sale-A-Bration Brochure. 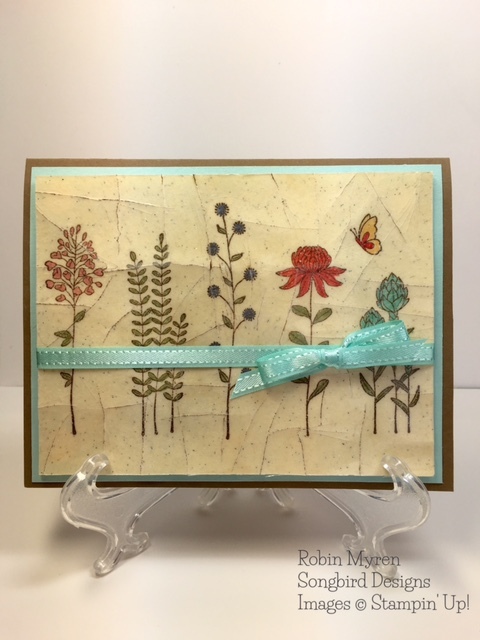 I love the look of three step stamping and I was able to use all three challenge colors in this sweet flower. 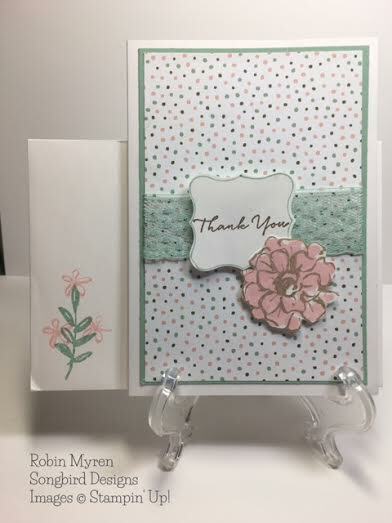 The lace stamped in Pink Pirouette, is from the set Grateful Bunch. I bought the set just so I could have this lace stamp! The rest of the set is great too! There's even a new punch for the hip flowers! You can find this set in the 2016 Occasions Catalog. 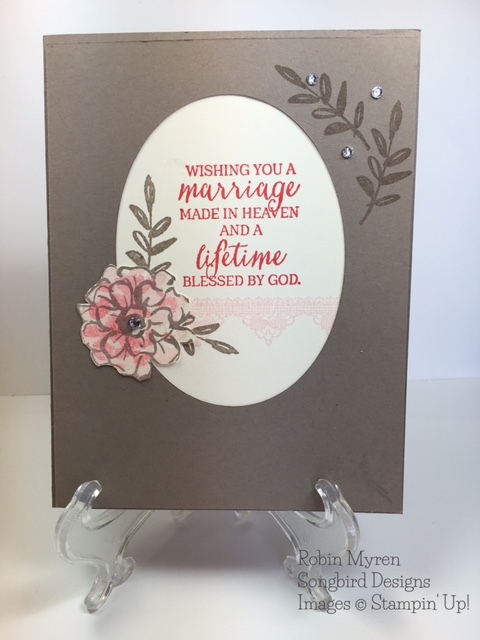 The sentiment is from Rose Wonder, also in the Occasions Catalog. This set has wonderful sentiments and the rose is AMAZING! This set will be on my shelf for a long time. It's wide open to lots of interpretations. Normally, I shy away from this kind of sketch. I usually like more details for inspiration. But today, I think it worked for me. You'll have to tell me what you think! The stamp set I used is from the Stampin' Up! Sale-A-Bration Brochure. It's call Flowering Fields. It can be yours for free when you make a $50 purchase! If you'd like more details, subscribe to my newsletter by filling out the form at the very bottom of the page. 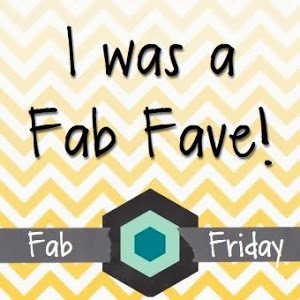 Each week I feature a new technique or stamping tip along with all the latest Stampin' Up! news. Have fun cracking up with this technique! 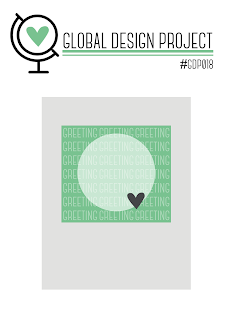 Obviously, I chose not to make a Valentine's Day card. I have most of mine done. However, there are several details on my card that mimic Connie's. Horizontal stripes. 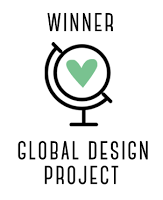 My designer series paper suggests stripes with the birch tree design. Baker's Twine. I copied Connie's placement of her Baker's Twine exactly. Main image. I don't have a heart as my main image, but I have placed the cute little fox in. the same place as Connie's heart. Candy Dots. I sprinkled a few Candy Dots on my card to give it some color. The Dots take the place of Connie's hearts. 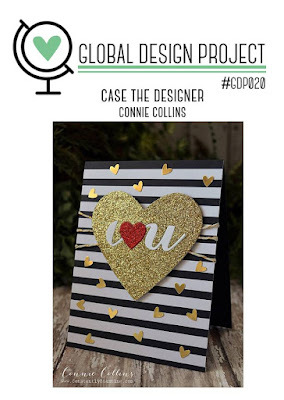 Did Connie's card spark an idea for you? If so, hop over and play along. 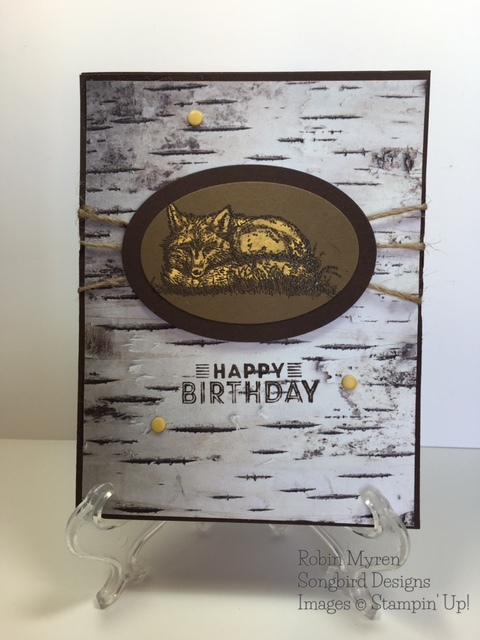 I stamped the dotted image in the Timeless Textures Stamp Set with Versamark onto my black cardstock. I then embossed it with clear embossing powder to give it shine. 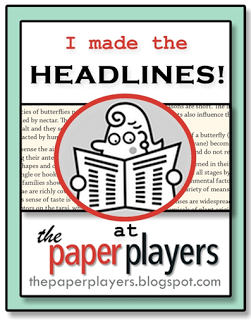 The designer series paper strip is from the Going Places Designer Series Paper Stack. 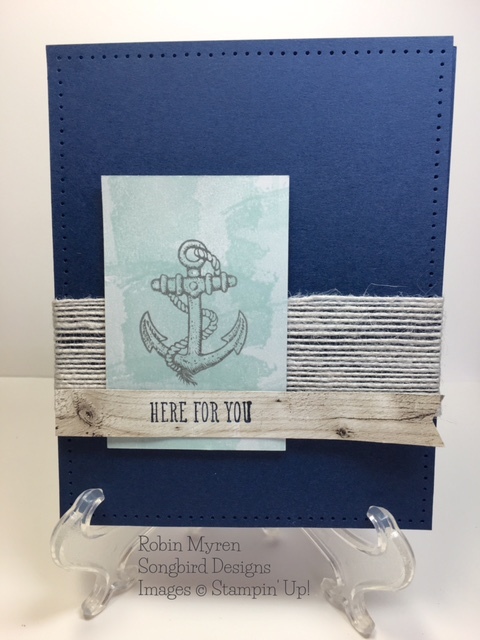 The Lost Lagoon strip is embossed using the Zig Zag Textured Impressions Embossing Folder. This folder is on sale this week as part of the Weekly Deals! I stamped the compass from the Going Global Stamp Set in Mossy Meadow. 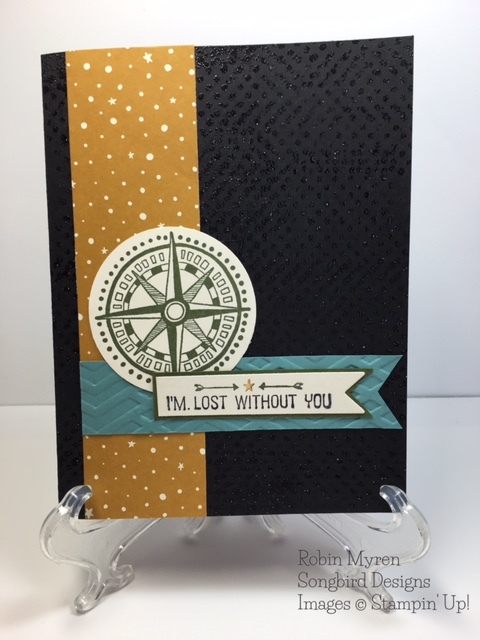 The sentiment from the same stamp set is colored with Basic Black, Delightful Dijon, and Mossy Meadow Stampin' Write Markers. I'm going to give this card to my hubby to thank him for all the things he does to make our household run. He spoils me rotten and I quite like it! Today's card is a Valentine's Day card using yesterday's sketch for Mojo Monday. I love making cards and treats for my family and friends. 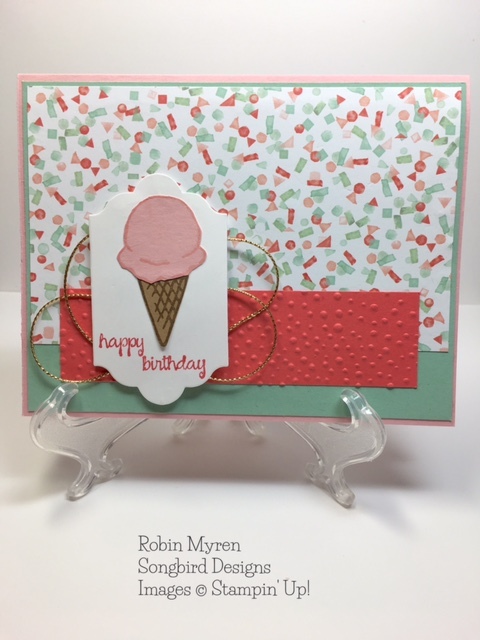 The striped paper is from the Birthday Bouquet Designer Series Paper Pack found in the Occasions Catalog. I seriously love every piece of paper in this pack! It's soooo pretty! The 2 hearts were cut using my Heart Framelets. The swirly heart is from the Perfectly Artistic Designer Series Paper Pack. This is a freebie from the Sale-A-Bration brochure. It can be yours with a $50 purchase. It's only going to be around until February 15 so don't delay in ordering it. The bling is sequins from the Blushing Bride Sequin Trim found in the Annual Catalog. I put tiny pearls on top of them to cover the holes. I hope I inspired you to start your Valentine's Day cards! I love Pacific Point for children's cards. It's such a happy color. The background paper is watercolor paper that has been VersaMarked with a brayer. I then embossed it using clear embossing powder. Next, I used an Aquabrush to brush Pacific Point ink over the entire piece. Finally, I let it dry and then cut it to size. 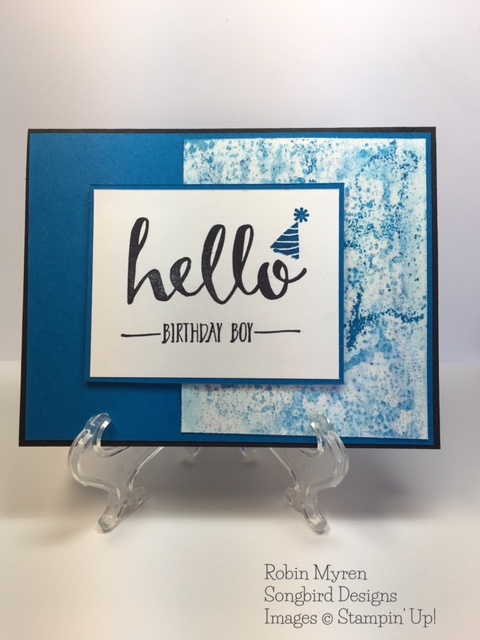 The stamps are from a Sale-A-Bration set aptly named Hello. This set is only available until February 15th so don't wait to long to order it. It's free with a $50 order. Isn't he a dapper fellow? He is a member of the Honeycomb Happiness stamp set. You can have this little guy for free when you make a $50 purchase during Sale-A-Bration. Do you like his tie? It's one of the Bow Paper Clip Embellishments found in the Occasions catalog. His neck was a little too big to clip the tie on. (Don't tell him I said that; it'll hurt his feelings.) I simply took a wire cutter and snapped the clip off. I then stuck it on with a couple of glue dots. Now I need to make him a girlfriend! 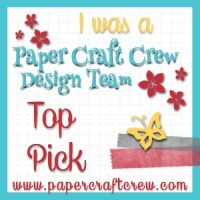 is from Stampin' Ups! Subtles Designer Series Paper Stack. I'm a polka dot gal so I adore this paper! The gorgeous flower is from the Birthday Blooms stamp set. It's a new set found in the Spring Occasions Catalog. It's a nice large stamp that is easy to watercolor. It takes a little time to fussy cut it out, but I think it's worth it. You can find these items in my online store: http://robinmyren.stampinup.net. This pretty card is being given to our church organist for her special day. I think she'll like it, don't you? I like to have small sentiments or no sentiments at all on my all occasion cards. That way they can have varied uses. 4 1/4 x 5 1/2 for the top of the card. I used my Paper Piercing Pack and mat to pierce a border around the top piece. Next, I glued a strip of White Jute Ribbon to the pierced piece. 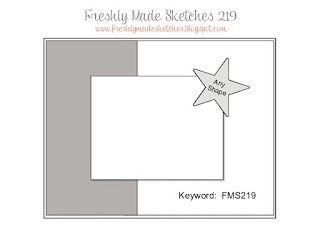 The 2 x 3 piece of Whisper White cardstock is stamped with Soft Sky using a stamp from the Work of Art stamp set. On top of that, I stamped the anchor from Guy Greetings in Basic Gray. 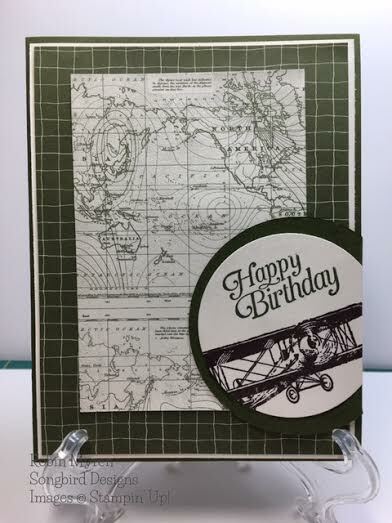 My greeting is from the set And Many More and is stamped on a piece of DSP from the retired Adventure Bound paper pack which is notched on the end. The pierced blue piece and the white stamped piece are secured to the card using Dimensionals. I used glue dots to add the sentiment strip. 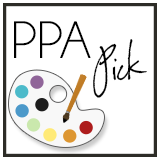 It's time for another PPA Challenge! 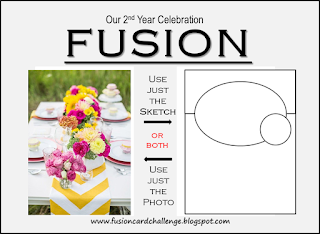 This week's challenge is a sketch challenge. They are my favorite, and I loved this one by Mary Fish. And Many More stamp set. You have to get this set! Finally, I diecut the finished piece using a die from the Lots of Labels Framelets, added some gold cording and popped it with some Dimensionals. Today I have a darling little Thank You note that uses some of Stampin' Up's newest products. The card and envelope come from the Note Cards and Envelopes set in the Annual Catalog. These are such a deal! You get 20 cards and envelopes for only $6.00! 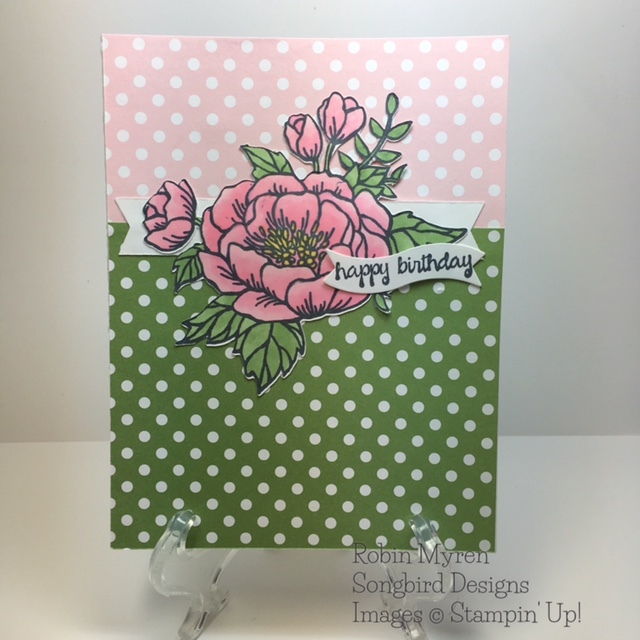 The DSP is from the new Occasions Catalog and is called Birthday Bouquet. 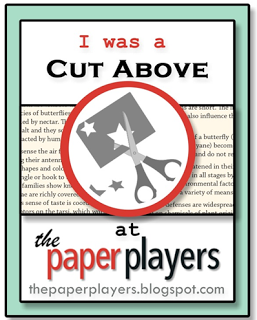 Each piece of this 2 sided paper is fabulous! It's a must have! The cute little flower is a 3 step stamp set called What I Love. This darling set can be yours for free out of the Sale-A-Bration Catalog with any $50 purchase during Sale-A-Bration. Nothing better than free stuff, right? Please email me if you would like the new catalogs. I'll fix you up! Hello Stampers! 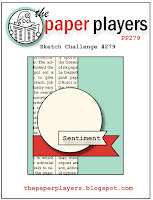 Today's card is for the Pals Paper Arts Challenge. This week's Challenge is a sketch challenge. Isn't this the perfect guy card? It uses two new products. The DSP is Going Places from the new Stampin' Up! Occasions catalog. The stamp set is Sky is the Limit and is one of the freebies you can get for every $50 you spend during Sale-A-Bration. 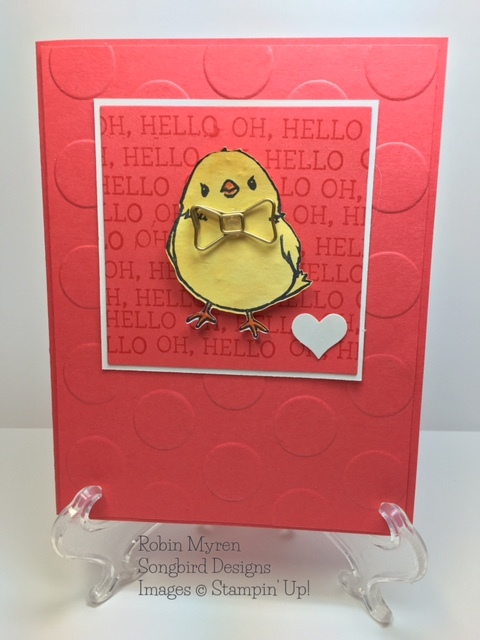 You can purchase these items starting Tuesday from my online store http://robinmyren.stampinup.net. If you would like a catalog and Sale-A-Bration brochure, email me and I will be happy to hook you up with one.